Returning a favour – Leasing power to the NAR Part 2. I greeted the world with a massive headache and I couldn’t even find my watch. I’d leased a taxi to get me to McLennan and had no idea if I was late or early. A call to the desk set me straight. There was time for a shower and a shave. Maybe breakfast. The sun coming through the hotel room window was somehow magically recuperative and by the time the car pulled up outside I’d began to feel human again. I picked up the keys at the desk, paid my bill, put away two sausage and egg sandwiches and coffee and left Rycroft behind me in the west. About an hour and a half later I turned off Highway 2, south onto Station Street, east again, and made out the familiar burble of my twelve-cylinder friend. Reliable and indestructible after all those years. If 5623 could do it, well so could I. And there she was. Far from her home road but tucked in between the busy cement plant and the UGG looking for all the world like she belonged there. The crew was missing. Probably at breakfast. I’d join them if I could find them. 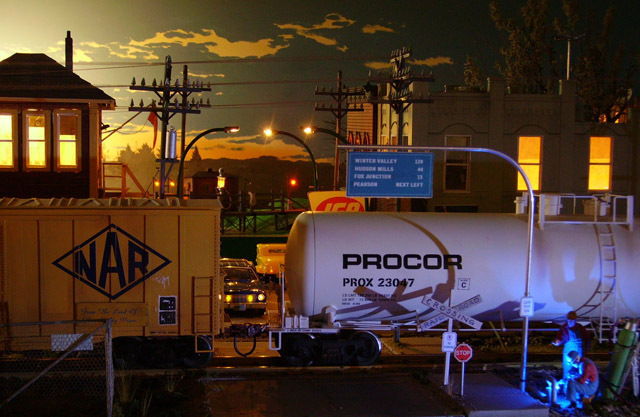 John Green, one of the charter members of the Central Okanagan Railway Company, created this scene on one of his two beautiful FreeMo modules. 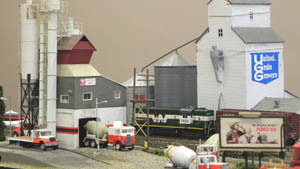 The building in the foreground is a model of the OK Ready-Mix plant in Vernon BC and the full size UGG elevator was in Barrhead AB. Both structures began life on his home layout but now everyone gets to see his work. I’ve always preached the modelling, in any scale, of actual buildings that really exist. John does an excellent job of this and it brings real life to his scenes. The first, and most obvious, place to look was the Waybill Café. An enterprising couple had negotiated the use of the baggage end of the station and turned it into a diner with a reputation for great basic eating. I pulled my ‘taxi’ up to the already busy platform and turned a few heads in doing so. There weren’t no yellow cabs in McLennan. The day was already well under way around here. 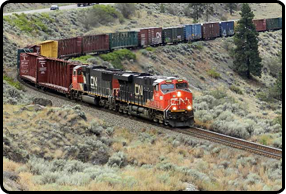 Our old Alco had finished moving a string of cylindrical hoppers onto track 1 and had broken out a British Columbia Railway boxcar full of dimensional lumber for some local project. One of those monster combines, right off the lot, was heading south in time for harvest and an old car that sure wasn’t going to make it through a harsh winter was in need of a tow even under this warm late summer sun. 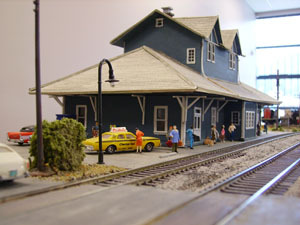 The station at McLennan is scratch built, as is the one at Rycroft. 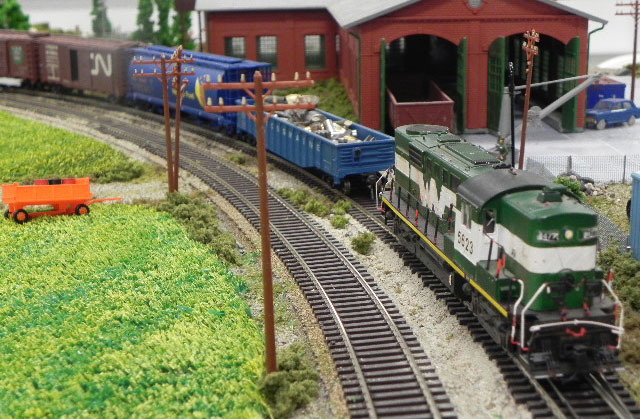 These stations, and the pictured rolling stock, give a wonderful ‘time and place’ to each of the modules that John has created. 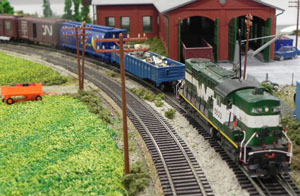 Not everyone can do this but even a simple coat of paint, in your railroad colours, will add a degree of personality to your layout. John is a complete ‘Sceneophile’ whose busy little sets drive me crazy but always entertain the public. In this one small photo John has created a driver getting roadside assistance from the CAA and a farmer driving his new combine home from the dealer. Busy? Yes. But visitors love it. The station at McLennan was one of those unique Northern Alberta Railway structures that would become a signature of the railroad. 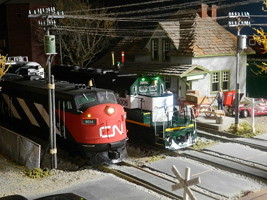 Unlike the WVRR, that made great use of well-known Canadian Northern structures, the NAR did their own thing – and did it well – prior to the CN/CP management period. The colour and lines were unmistakable. But I was here for a real breakfast with my crew. (Don’t be counting the A&W’s. That was just traveling food.) Two eggs, over easy, with hash browns, bacon, sausages and a pancake. Also four whole grain toasts, a large orange juice and an endless cup of coffee – no sugar. When I caught their attention over by the corner window they had just about polished off much the same plate. It was good to see the guys again. 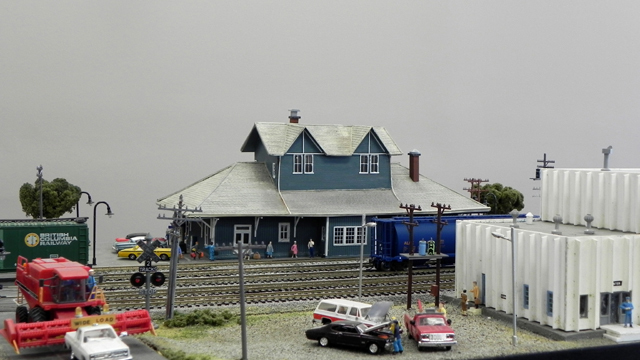 In all scales, and in the smaller scale particularly, modellers have to allow the buildings to tower over the trains just as they do in real life. So many times I see structures reduced to a rump of their real size just to accommodate trains and track. 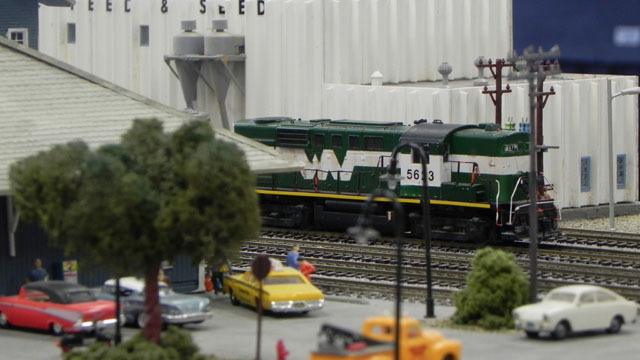 Yes, the hobby is about railroads and trains, but it’s also about the art of the scene. Build the track work first, check it out for operation, but if you can’t find room to build that full sized steel mill don’t even try. The ‘Travelers Breakfast’ was interrupted by the sound of my old RS-10 as she came to an easy stop just outside the restaurant window. She looked pretty good out there actually. Course, she didn’t have the lines of the newer models, and only ½ the power, but she looked business-like and all together a part of her railway surroundings. I fully expected her crew to be turned out in striped cover-alls and red scarves but no such luck. Like me, jeans, a T-shirt with a message and a ball cap were the order of the day. We grabbed our kit, everything we needed for a day and a night in one bag, made our way out to track 3 and climbed aboard our ride. The guys had already been made aware of the days work but still; the list was properly posted on a clipboard over the left hand seat. Seems the big job was at the scrap yard. I was going to see Arnolds place from a different perspective. The stations at Rycroft and McLennan set the time and place but in this short story I used one of my own engines, in HO scale, as a prop. 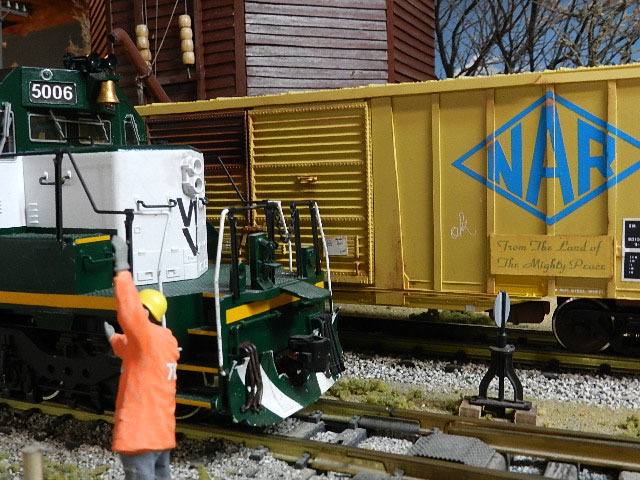 No, the Winter Valley did not polish the railheads on the real NAR but that doesn’t matter. 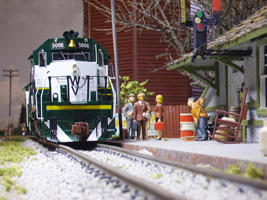 What matters is that there is a working engine – with sound – at home on the FreeMo layout that everyone can call up and use. 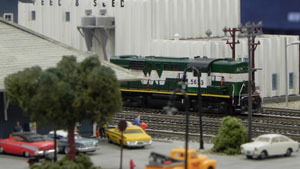 I left it there at the storefront layout so the public could run it and get a taste of DCC and model railroading. The simple throttles offered forward, reverse, bell, horn and speed and that’s all they need. Hell, that’s all I need. More than that and I think your not running trains any more. Your running throttles. Within the hour we approached a broad curve leading into the scrap dealers siding and ‘factory’ spur. The place was overgrown with rusty things. An apocalyptic world of iron and steel and copper and weeds. Our well groomed track offered the only sign of “give a damn’ in the whole scene. Never the less, as we slowed to a stop I stepped off onto the ground and made my way back to the 1st car. One quick lift, our engine was released and a wave moved it forward of the switch. We would have to pull the full gon out of the shop, get back to our train, hook up our empty, get back to the switch, set the empty on the scrap yard track and return to the main line with the load. Four throws of the turnout for one carload, reconnecting the air at both ends and getting back to the cab. No one said it was an easy job. Very little of the module track has been ballasted. We found out some years back that it only caused problems. Our members have had home layouts with main lines approaching 700 feet. No ballast. When properly sceniced, there was too much going on beside the track, as well as running on the track, for the naked rails to be a visual issue. 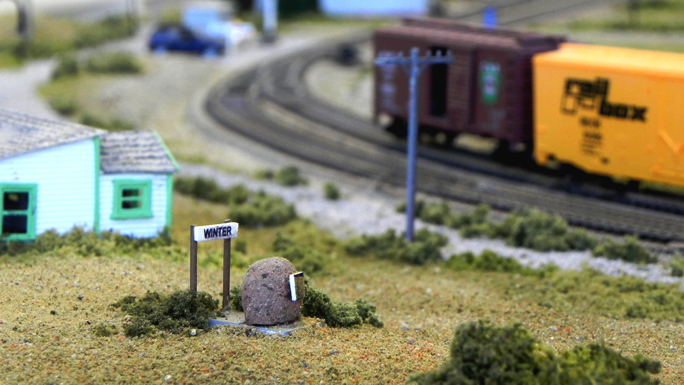 Would I ballast the track for a small diorama or for a photo? Sure would. But not on our operating layout. And it’s paid off in construction simplicity and trouble free operation. That field on the left is made out of that bright green indoor – outdoor carpet that was everywhere in the 70’s and 80’s. I raked it up with a wire brush, dry-brushed it with yellow latex house paint and glued it in place. Covers a huge area real fast, looks ok, and can be lifted up easily for future construction. By the time evening arrived I was pretty much beat. I had forgotten how tough it was to be a crewman on a shortline railway. Somehow they must do it for the love of the job because they weren’t getting rich. I resolved right then to sign on as brakeman once a month when I get back to home. Our territory was shorter by far but in many ways much more challenging, and I really needed to stay in touch with the nuts and bolts of the railroad just to do my job. 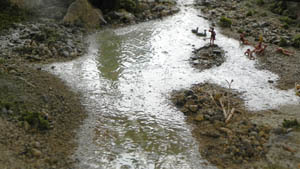 A bunch of kids and dogs enjoyed the last warm days in the river below and made my think of a five-day a week job. 9 to 5 and all that. I felt the engine rev up under my feet and the feeling went away. During my last trip back to the prairies I took hundreds of pictures. Trackside structures, derelict industrial buildings, abandoned farms, grassy fields, even fence posts and those small clumps of trees that spot the prairies everywhere you look. Only on getting home did I notice just how much wetland there was in each photo. Not surprising then that when we were laying out some scenery ideas for our prairie oriented FreeMo that we included a lot of water. In a few minutes McLennan would be on the horizon. The lights would be on by then and it would hang there like a diamond necklace in the dark. I would climb down to thank the NAR guys and find my way back to a hotel room. Maybe get the House Special delivered and crack an ale or two. This had been way more than a holiday. It had been a wonderful learning experience. I saw and felt a modern railway in action, met great people, learned a bit of railroading from the experts and, on a personal note, found my namesake village and witnessed the ravages of time on a once thriving little community. Change is everywhere – all the time. After much debate with the ‘train runners’ in the group we still managed to create a few typical operational challenges. There were single-track bridges and other single-track prairie scenes in the mix. 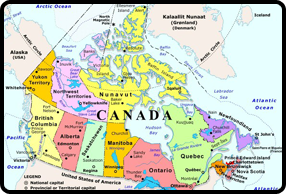 My argument was “This is not the Montreal – Windsor corridor. This is a prairie shortline.” Even on completion the debate continues. We are adding very long passing sidings on our Kettle Valley Railroad layout at the Peachland Museum as well. Heavy rail is being pushed through sleepy villages all around the room. Family picnic sites and quiet cattle crossings are no more. Such is ‘progress’ I guess.